Video is the most engaging marketing medium and the preferred way of viewing content among consumers and business owners. It is the best way to humanize your brand and captivate your audience. We help you market your business with video to raise awareness, build leads, gain clients and retain them. At RealBold, we build a video marketing strategy with your goals in mind and then prove success through meaningful metrics and analytics. We work with you to fully understand your needs and goals, then develop a strategy and plan that will employ the power of video to effectively reach those goals. We can work with you to integrate video marketing with existing marketing campaigns or complete strategies for your video campaign’s success. How will people see your videos? Where will you put them to ensure their success? The answers depend on your goals, your target audiences and where your organization’s communications strengths are. We will help you determine the best places to distribute your videos, from obvious choices like social media, tv and your website, to some channels you might not have thought about. We optimize your video so that it drives search traffic directly to your website, instead of a video sharing site. We help ensure that your search terms display your video thumbnail in Google search results. When you send a video to your mailing list, you can review who on the mailing list has watched your video, how much of it, and if they re-watched any specific portions. Great for lead nurturing and lead scoring. Works with most popular mailing list services. We provide ongoing support that will help ensure your videos are optimized and effectively deployed. With the benefits of analytics, we can make contextual adjustments and/or edit videos when needed to ensure that videos are helping you effectively reach your goals. We provide in depth tools to determine how videos are being watched and if they are leading to your goals. From built in tools to integration with Google Analytics, Salesforce’s Pardot, Hubspot and Marketo, you can have a deeper understanding of how well your videos are working. This goes beyond play counts and subscribers, but provides meaningful data that will help you sell better. 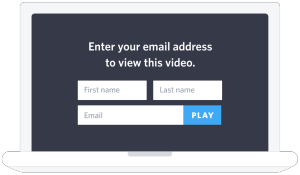 Capture emails right in the online video player. With this tool you can build your mailing list and integrate with your favourite mail list, CRM, sales or marketing automation tools. You can see who is watching your videos, and use this data to nurture leads. We are, and we can't wait to work with you on your next project! We are a full service video production house. We have the capacity to work with you to develop your video concepts and see them through all the way to distribution and deployment.